This article was written on 15 May 2018, and is filled under Art Department Resources, Past Exhibitions. Summer gallery hours are limited to weekdays from 10 am – 4 pm. This exhibit was curated with the assistance of student interns Lisa O’Donnell and Anya Jeninga. Working with the idea of selecting examples from the collection that fit our motif we organized an exhibit that includes some collection highlights like two Andy Warhol prints along with pieces that are not regularly on display. 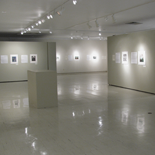 Examples of paintings, prints, ceramics and sculpture make for a well-rounded exhibit. Works on display come from a diverse variety of artists including several outsider artists exhibited side by side with more traditionally trained artists. The majority of the artists are from the US, but we do include a photograph by Chinese artist Liu Bolin and an African Barber Shop sign. Recent additions to the collection, including a new Kiki Smith print acquired through the Madison Print Club, will be rotated in over the course of the exhibit. Other examples we will present include a selection of works by German artist Wilhelm Höpfner that are being prepared for a future exhibit at the Art History Museum at UW-Milwaukee and a recent gift of a tapestry by Dirk Hogler. © 2018 Crossman Gallery. All Rights Reserved.